Time in way: 1 h. 40 min. Karlovy Vary is Czech resort with worldwide popularity, which is situated in the western part of the country and it is separated from the international airport in Prague by 120 km. You can overpass this distance easily, to do this you can choose one of offered kind of transport or book personal transfer from Prague to Karlovy Vary. Bus is the most economical and popular way among tourists to get to Karlovy Vary, but at the same time it’s rather comfortable. Bus goes every 30 minutes or hour from 7 am to 10-11 pm (schedule changes all the time, so you should find out all the details before your trip). Runs are served by one of the biggest transport company in the Czech Republic – Student Agency. 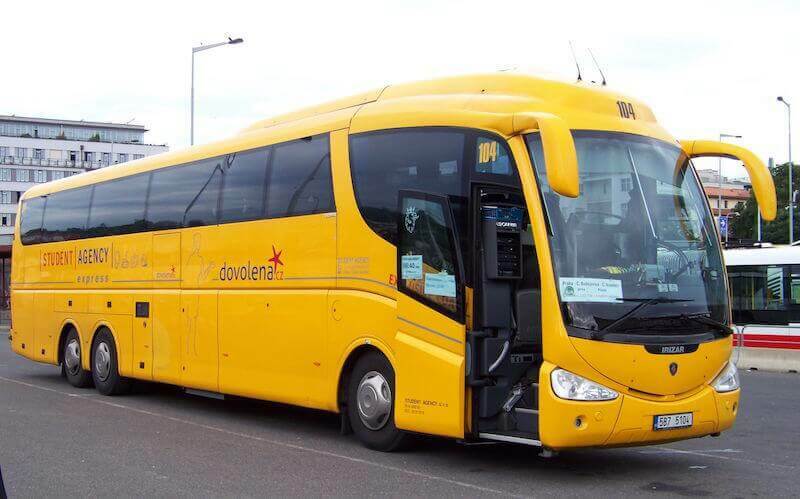 All buses of this company are yellow and they differ their comfort – there are toilets, air-conditioners and Wi-Fi. The bus stop is not far from the exit of the arrival hall, you just should cross the road and overpass parking place and you will notice the tablet «Student Agency». Tickets for the bus from Prague to Karlovy Vary you can buy in every transfer office in the airport (it work 24 h), ask the driver, but you would rather book them on the site of the transport company beforehand (especially if it’s hot season), the price is about 160 Czech koruna (about 5.9 euro). If you buy ticket online, you can also choose and book your seat. The whole trip from the airport of Prague to Karlovy Vary will take you about 1 hour and 45 minutes. Second way – is trip by train, but in this case you should spend more time and money. But there are wonderful views, that change everything and they will be opened to your sight during the whole trip. Train departs from the main railway station in Czech capital, which is situated in the centre of Prague. The easiest way to get from the airport to the railway station is direct air express, these buses go from terminal 1 every 30 minutes from 5.30 am to 9 pm, going through terminal 2. The bus stops are situated in front of the exits of the arrival hall. You can ask the driver for tickets and it will cost you 60 Czech koruna (tickets for children till 6 year old are free). The road will take you 45 minutes. It will take you 20-25 minutes if you go by cab and the price will be about 400-600 Czech koruna. 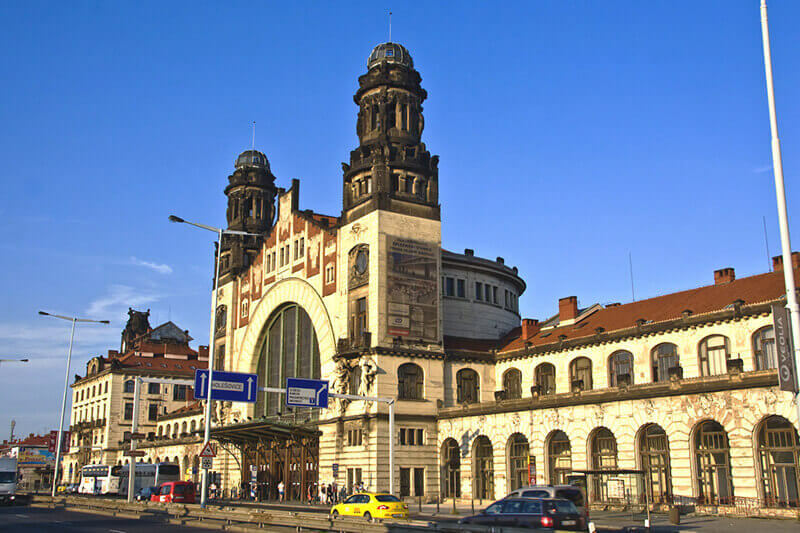 You can buy railway ticket by your arrival in the booking office or in the terminal, also you can book it beforehand through the Internet, it costs 160 Czech koruna. The first train departs in 5 am, the last – in 5.30 pm, they go every 2 hours, and the whole trip will take you 3.5 hour. Those who don’t like variants with public transport can rent a car and get to Karlovy Vary by themselves in 1.5 hour. To rent car you will need passport, license and deposit in 200 euro, which will be returned after renting, if there was no car accident during renting. The petrol will cost about 30-40 euro and for renting service you should pay from 50 euro per day (the price depends on the class of car). 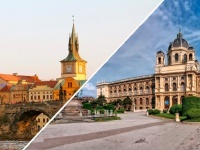 There is another way to get with big comfort to Karlovy Vary – it’s booking personal transfer or taxi. Cars of official taxi companies in Czech have number on the door and sign «Taxi» on the top. You shouldn’t use taxi, that stays near the airport, because they will be more expensive. You should better book your taxi by phone, ask the operator about the price, because the driver can tell you higher price. Middle trip by taxi will cost you about 90 euro and the trip will take you about 1 hour and 45 minutes.